Democratizing the publication and dissemination of medical science. I was hired to interpret and design the vision of a journal that would disrupt the academic publishing industry. I led all aspects of research and design to create a free, self-publishing SaaS platform for physicians and researchers that is indexed in the National Library of Medicine. The academic publishing world has traditionally been controlled by archaic print publishing houses charging exorbitant publication fees, having extremely lengthy publishing times, locking content behind pay walls, political bias, and overly influenced by a mis-used metric known as Impact Factor (IF). The Cureus Journal of Medical Science was created to democratize medical science. The decision to publish with a medical journal is based largely on two factors: indexing in PubMed Central (NLM), and Impact Factor (IF). As a new journal, neither of these are realistic to achieve as both require a review by traditionally biased controlling boards and are (supposed to be) based on the “quality” of the journal in various aspects such as Editorial Board members, published content, adhering to ethical enforcements, usability, etc. Therefore, to attract new authors and content, we needed to emphasize our available aspects of credibility and design smart marketing that would stir curiosity. As predatory journals were popping up like weeds, establishing trust was immensely difficult without the backing/affiliation of a known publishing house. So, our niche audience of physician authors and researchers were very skeptical of a new journal that taunted free publishing—let alone low fees. Furthermore, busy medical professionals don’t have time to explore or learn a new model of journal so they tend to stick with the known as often their career advancement depends on it. Lastly, with the exception of our CEO, Dr. John Adler, our team of five developers and one UX/UI designer (myself) were entirely new to the academic publishing industry, and didn’t know anything about it. So, we needed to learn all we could about the space we were building for. As the Director of Product & UX, I reported directly to the CEO. Within our Lean start-up, my role was a daily balance of UX, PM, UI and Communications design—and for the first two years, Marketing Strategy and Business Development as well. I spent several weeks reading, researching, having casual chats, conducting interviews and meetings with physicians of varying specialties and positions in their careers who’ve published their work in a diverse range of journals. With the new team, my first priority was to establish trust, clear communication and a sense of purpose. To do this I led product meetings, shared my research to educate my teammates, and hosted all-hands design charrettes, giving everyone a sense of ownership. Using the results of my research, I created a Product Persona (with Content Style Guide), User Personas and a new marketing strategy to uniquely position our product as the leader in a new generation of academic publishing, as well as inform forthcoming product decisions. From a product standpoint, there was no UX to speak of when I joined Cureus. The existing website was largely a concept placeholder with heavily fragmented experiences, product functions were siloed, and navigating the site was far too much to ask from a busy physician. 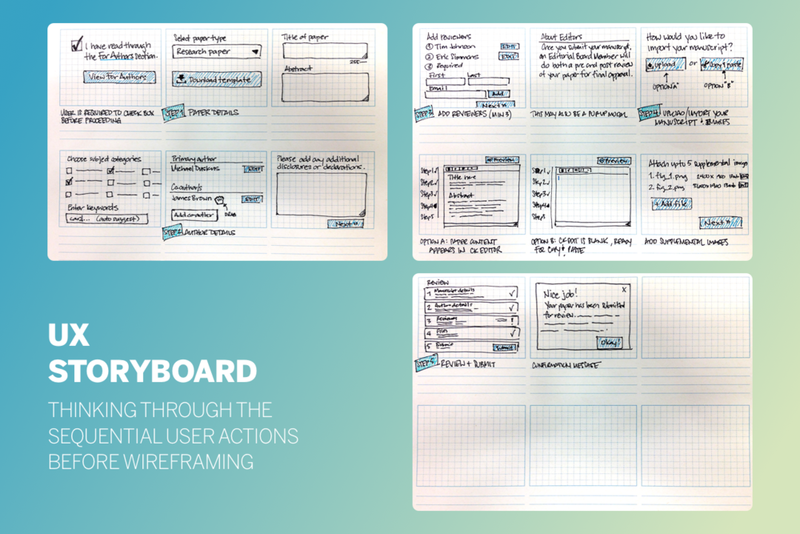 I immediately began hand sketching wireframes for every existing page, and storyboarding key user flows and microinteractions. I had to completely re-imagine and re-design the initial product concept and then get it in front of users immediately. Using a combination of paper prototypes and clickable mock ups (Balsamiq/PDF), I tested variations of key pages and actions with users in person, via phone, video conference and screen sharing. My efforts were regularly split between continual user research, competitor/market research, designing for various needs, reporting on our OKR’s (e.g. grow published content by 2x, improve frequency of email campaigns, etc.) and KPI’s (user acquisition, page views, published content, etc. ), and sitting with the developers to implement UX and UI. The initial new homepage and other identified pages of importance were launched within 90 days as we continued to backfill other areas of the site with new and improved features. Credibility was further established through consistency and repetition of visuals and appropriate copywriting. The team was also able to implement several new repeatable workflows, processes and standards that allowed us to maintain a productive agile development approach. Cureus was recognized as a disruptive new thought-leader in the Open-Access movement of journals, proving the ability to publish medical science faster. It is currently accessed by more than 100,000 physicians and scientist world-wide. With its highly unique, free, self-publishing system, published content has grown by 300% within three years and is now indexed in PubMed Central . Indexing in PubMed Central established Cureus as a legitimate journal of medical science, giving confidence to authors that their work will be findable in the National Library of Medicine. Shortened the perceived length of the publication process with logical grouping, labeling and cleaning up of states. This effectively shortened the length of time from author submission to final publication from 8-12 weeks to 3-5 weeks, and later to under two weeks. With a clear value proposition, product positioning and marketing strategy, our very niche user base grew from approximately 500 to more than 10,000 active users within 36 months.